Goober and Muffin were the best of friends; no matter that Goober was a puppy and Muffin was a kitten. As Goober and Muffin grew up, their friends started complaining that it was not okay for them to be pals. Succumbing to peer pressure and going their separate ways seemed to be the only answer, even though Goober and Muffin were both miserable. One day, a calamitous misadventure reunites this unlikely twosome, reminding them what really matters. Turning their backs on prejudice once and for all, can Goober and Muffin go back to doing what they love best, being best friends forever? 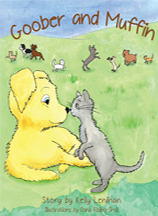 A sweet story beautifully brought to life with charming illustrations, Goober & Muffin is just right for wee ones who love being read aloud to and for children just learning how to read. 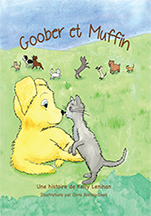 There is also a Goober and Muffin Coloring Book that follows the story, available on Amazon. 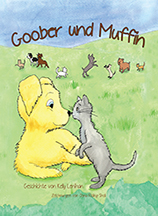 Borrow Goober and Muffin from your school or public library. Whenever possible, please support independent bookshops. From childhood through her college years, Kelly Lenihan was forever making up stories, often writing them down. After completing a general arts degree from the University of Washington, Kelly went on to enjoy a diverse range of creative endeavors, from fashion design and hand-painted pottery to web design and teaching global arts. Never losing her penchant for writing; she’s been published in various magazines and enjoyed her own newspaper column for several years. To this day, she is an avid blogger and has more children’s picture books in the works as well as several full-length books. As a parent, Kelly delighted in sharing her love of the magical world of books by reading aloud to her two boys. Many nights, her younger son would place his tiny hand on hers while looking up with big, brown hope-filled eyes, (most likely as a stalling tactic) and plead for “one more story” – how could any parent refuse? So in the moment, Kelly began making up stories. Goober & Muffin – along with The Skipping Stone – are some of those stories and they remain beloved family favorites. Note from the Author: Goober and Muffin’s loving friendship highlights the value of unconditional acceptance and that differences in appearance do not matter as much as having each others’ back. In today’s turbulent times, it can be hard to protect the natural innocence inherent in young children. As parents, we hope we never have to face questions about prejudice; it is almost certain that we will. 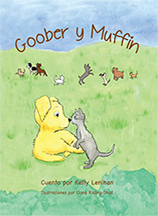 I invite you to share the story of Goober and Muffin with your children as the touchstone to an important conversation about diversity, empathy, peer pressure, and what’s truly important. Oona Risling-Sholl is an autodidactic artist hailing from foggy northern California. Her portfolio includes painting, drawing, and printmaking, as well as graphic art and poster design. She has also designed theater sets and backdrops for troupes and events throughout Northern California. This is her second time illustrating a children’s book.